Surely one of the more arresting duets in dance film history takes place in Glove Story: a couple, in evening wear, embrace in a slowdance in the rain, gasping and choking as the water pours down their faces. As the camera pulls back, we realize they are dancing in a tiny shower stall. After I finished watching Glove Story, I could not shut up about it. The intention and mystery about the dancers kept me captivated throughout. It truly is a piece of art. Dancers, music, sets, costumes, choreography, emotions and editing; everything comes together in this 37-minute film perfectly. Glove Story, a funny and thought-provoking collage of riffs on the infringement of personal space, by Israeli director Oren Shkedy and choreographer Dana Ruttenberg. Intimacy repeatedly goes awry in this opus, set to a wide-ranging score that includes a Liszt Hungarian Rhapsody, Fauré's Requiem, a plaintive cover of Randy Newman's anti-hymn "I Think It's Going to Rain Today" by Ayelet Robinson, and a chirpy television interview of New York Times reporter Michael Grynbaum on matters of etiquette. The political hovers like a shadow, from the comic opening scene of an aspiring museum visitor being manhandled by a security officer against the backdrop of the formidable, swirling concrete and steel structure of the Design Museum Holon just outside Tel Aviv. Surely one of the more arresting duets in dance film history takes place in Glove Story: a couple, in evening wear, embrace in a slow dance in the rain, gasping and choking as the water pours down their faces. As the camera pulls back, we realize they are dancing in a tiny shower stall. Private I’s is my favorite in the festival of the heart, and that is due primarily to the amazing and precise interpretation of Shafir and Yudilevitch, but also to the the tight editing, sensitive choreography, perfect harmony between the music and rhythm, and the distinct flavor of each scene. 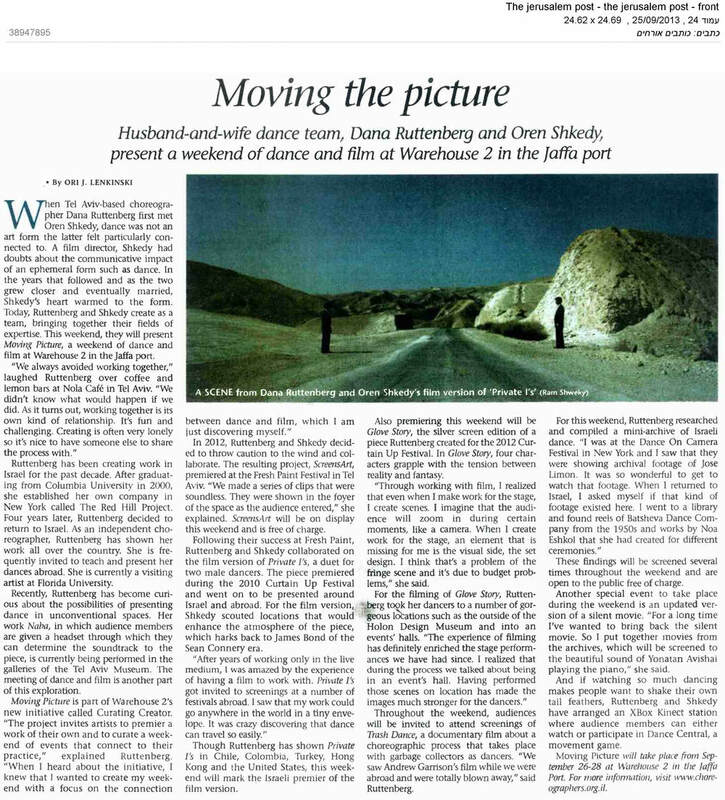 The dance film is about the relationship of the two men, in turn composed of complicity and tension, and as tinged with sensuality as with force. At their first appearance, they are facing the camera, to us. They seem to invite us to a duel, one performs a back-flip with no hands, without rushing, while the other stands watching us frankly. The mixture of sincerity and mystery grabs us to transport us into their world. We rarely see the precise expression of their faces, yet the emotions are there, palpable: the picture shows them often entirely, sometimes only tiny in the vast beautiful breathtaking landscapes, as if the charisma they emit required no close-up, or even demanded a certain distance to grasp them in their entire integrity. In a scene shot in the desert, one of them removes his shirt, and blindfolds himself with it. He dances without landmarks, trying to dance with the other dancer, perhaps to cover himself with the other, his witness, he attempts to let go. He performs a blindfolded back-flip. This risky move reveals his vulnerability. It’s the incarnation of beauty, as if nothing else could exist besides a blind dance in the sand. What touches me is precisely the contrast between strength and fragility, between the performance of control, and the assumed risk of losing control. By contrast, this allows the viewer, to varying degrees, access to an intimate part of his person, despite the distance imposed by the camera. Among the works that caught our attention, is the beautiful Israeli film Private I’s by creators Oren Shkedy and Dana Ruttenberg, based on a work for the stage created by Ruttenberg. A pure delight from beginning to end, this film combines a delictae kinesthetic devoid of artifice to force a wild desert landscape into the heart of masculinity in an interpretation that makes sense .In a series of touching and stunning scenes,Private I’s is captivating. Moreover, the film has received a Certificate of Distinction from the jury for its artistic quality and its original proposal.